The barn is set in rural hills and surrounded by rolling farmed fields. The stable comprises of a ground floor lounge diner, kitchen area, a shower room with toilet. The upstairs bedroom, which has a double bed, fitted wardrobes and chest of drawers, has a small balcony which overlooks orchards and fields. The kitchen is fully equipped, complete with fridge (with ice box) dish washer, microwave, built-in oven and washing machine. An electric "log burner effect" fire gives a focal point whilst the underfloor heating downstairs makes you feel cosy and warm on those cooler evenings. Free wifi. The TV has access to both English and French channels and has a DVD player. Fresh eggs can be collected from the nesting boxes of our free range chickens. There are bikes available for you to use throughout your stay as well as a bike carrier if required. There are plenty of places to explore throughout the area, whether it be by car, bike, or walking. Our aim is to ensure our guests have an enjoyable and relaxing stay. We are close enough to give you any assistance you may need but far enough away for you to enjoy your privacy. We are situated less than two miles from the village of Bais (prono. Bay) This typical French village is complete with Tabacs/ Bars, Bakers, General Stores, Garage, Pharmacy, Bank (with ATM), and a Post Office. A small local market takes place outside the church every Wednesday. The Mayenne area of France has much to offer. It is farming country and most of the villages and towns hold events throughout the summer, including village fetes, exhibitions, fishing competitions and live music, most of them free. The famous historic town of Mayenne, perched either side of the river, has it's own Chateau, now a museum and the Basilica de Notre Dame. It has plenty of quality boutique shopping as well as it's twice weekly market. A favourite pastime is sitting in the square, sipping a coffee or wine whilst enjoying the local Plat-du-Jour, in the sunshine. In addition to our local swimming pool: at Sillé-le-Guillaume, just 20 minutes away. there is a wonderful lake with a sandy man-made beach. The area offers horse and donkey rides, boat trips, bike hire, bars and restaurants. For the bargain hunter or the curious, there are also many weekend "vide greniers" (literally "empty attic"), the French equivalent of a car-boot sale, but where a whole village is usually involved, with locals selling off the items they've had stored since last year's Vide Grenier at their village. Generally there are refreshments available and sometimes, street entertainment. Within a 30 minute car journey there are lots of small medieval towns that retain their charm and history for you to discover and explore. Sainte-Suzanne with its 1000 year old walled town with an ancient fortress and château. Jublains with its extensive Gallo-Roman remains. Lassay-les-Châteaux, with one of the best examples of a fortified medieval château in France, complete with a working drawbridge and barbican. There are plenty of activities and the area is particularly noted for walking/rambling, cycling, fishing, horse riding, exploring ancient woodland or just driving through the beautiful countryside and forests. The Alpes Mancelles are a short drive away with the beautiful villages of St Leonard de Bois and St Ceneri on the banks of the River Sarthe and there's plenty of scope for peaceful picnics - or try your hand at kayaking down the river. 40 minutes away is Le Mans, the home of the famous racetrack and it's 24 hour race, amongst many others. The town has some amazing contrasts between the medieval town with it's stone walls and cobbled streets, it's post war rebuild and it's new modern buildings. There are regular markets taking place throughout the city, but a favourite is the Sunday morning one, with the colours and smells of the food market and the array of brocante and flower stalls. Bais and the surrounding areas have so much to offer everyone. Locally it is referred to as the "France like it's supposed to be, The French secret". We look forward to meeting you and sharing those secrets. We both took the decision to take early retirement. Until that time we were a working professional couple. I was an Assistant Headteacher at a Primary School and Trish was a Nurse Practioner at a Doctors Clinic/Practice. We decided that it was the right time for us and moved to France in 2013 because we wanted to complete our renovation here ourselves, rather than working to pay others to do it for us. We love this area of France and the people we had met when holidaying before we purchased the property and those we have met since. Shower cubical, toilet and basin. Cupboard with ironing board and shelf space. 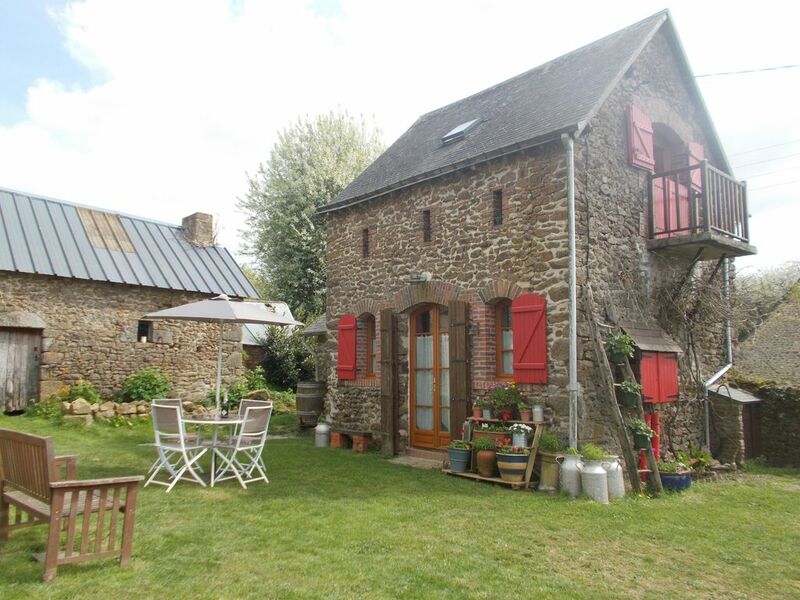 This is a lovely little gite, perfect for two people. It’s amazingly quiet and a peaceful locale to relax. There are lots of nice hidden historical gems in the surrounding area to explore, as well as quaint villages and lovely nature areas. The owners provided a nice welcome basket with staples and there were fresh eggs from the chickens. Highly recommend! A wonderful place to relax and tour the Mayenne Valey at your own pace! First, the Stone cottage was just perfect! Everything we saw online was exceeded by the reality! It is obvious that Trish & Dean put their heart and soul into making a warm & cozy place to relax. The workmanship is fantastic and the location lent itself to seeing everything from the Normandy coast to the midevil castles and chateaux in the surrounding countryside. We were privileged to be invited into the main house which had undergone a similar transformation from the cow barn it had been.....beautiful! Most of all the hosts made the stay worthwhile. Although we did not get to meet Dean, the time spent talking with Trish made our last day a perfect end to a perfect trip to 🇫🇷 France! Very comfortable accommodation in a peaceful location. We couldn't fault it! We stayed only four days but thoroughly enjoyed our holiday. The cottage was very comfortable with everything provided including fresh eggs each day from the resident hens, and the goats were a constant source of amusement. Trish was an excellent hostess who did not intrude at all on our privacy but it was reassuring to know that she was there. If you love the peace and quiet of rural life then La Ronciniere is the perfect place to relax and unwind. The cottage is beautifully decorated and has everything you need, including an amazingly comfortable bed. The outside space is private and the goats and chickens provide great entertainment. The nearest town is small but the Boulangerie sold the most delicious croissants which were perfect for breakfast. Many larger towns are a short distance away and there are a number of traditional French markets to wander round. Dean and Trish were fantastic hosts who were very unobtrusive, but there if you needed them. This is one place we would happily return to. A little piece of Heaven in the Mayenne Countryside! My time here was just wonderful! Trish was a lovely, friendly hostess! The home was so cute and well furnished - all the comforts of home. I loved the tranquility and could have spent more time soaking up the fresh air and enjoying the sights that are will within easy driving distance of the home! When I am back this way, I will certainly make it a point to stay here again. My Husband and I stayed in this delightful converted barn surrounded by fields, peace and bird song. The barn has everything that you need for the stay, a comfortable bed, a well equipped kitchen and bathroom, nice outside space with a bbq and many beautiful places to visit all within less than an hours drive. Trish explained everything, was really friendly, welcoming and gave us ideas of places to visit. We collected fresh eggs from the chickens and enjoyed watching them through the fence. The supermarket is 5 mins drive away and the village has a bakery too with delicious cakes. I would thoroughly recommend a stay in this rural brn cute barn. As one of us is a teacher, we have decided that our fees will remain the same throughout the year and NOT increase them for school holidays.